As you probably quickly realized when reading this blog, I’ll do a lot for a commemorative t-shirt. 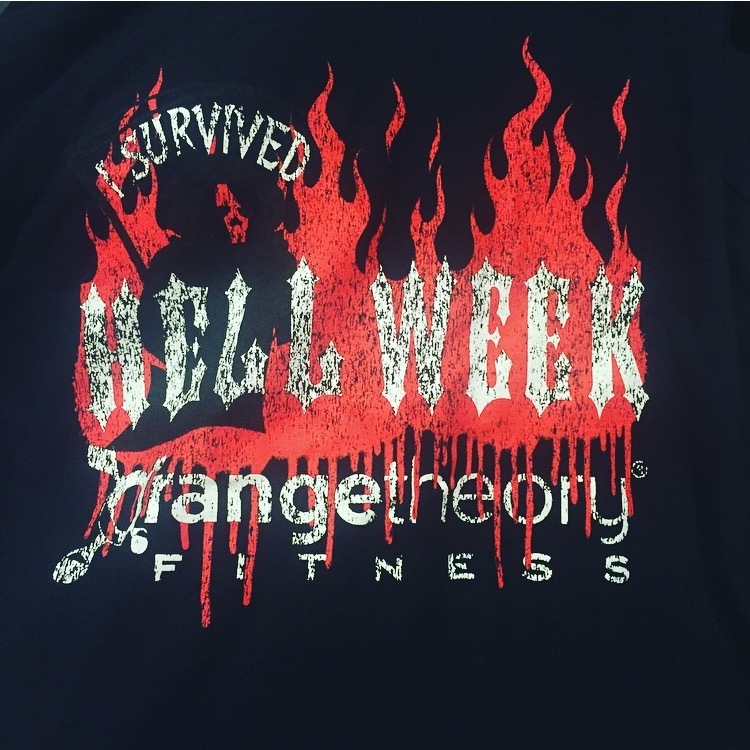 This past week, I earned a free t-shirt and lived to blog about it by completing five days of Hell Week at my local Orangetheory studio. Here is my recap of the pain and glory. We started with a normal warmup–either on the treadmill or the rower. I was on the rower. Then the first block was 23 minutes on the rower, doing intervals of varying length (most around 2 minutes) and alternating between a “base” pace and a “push” pace. Then the final few minutes were shorter intervals alternating between an “all out” pace and a “base” pace. Between the warmup and the rower workout, I logged over 6000 meters of rowing. I’ll say, it is pretty tough to get into the orange zone with rowing–it requires serious intensity. So I was working hard to really push with my legs and take long, hard strokes. Just a few minutes into rowing, I felt my upper glutes starting to burn. A few minutes later, my whole backside, from my lower back to my upper hamstrings, was on fire. At first, I thought “This is great; I must be working new muscles” but then I started to question whether the discomfort I was feeling in my lower back was sign that I wasn’t using my back properly. I just tried to keep going and focus on using my core to support by back. I made it through but really had to back off the intensity toward the end of the 23 minutes. Next, we moved to the treadmill/floor block. This involved about five rounds of alternating between a sprint on the treadmill and TRX rows, chest flies, and side plank dips on the floor. When I stood up from the rower, my lower back felt “off.” Sort of the way it hurts after a long run. Although I wasn’t too concerned (i.e., I didn’t think I had seriously injured myself but was worried about feeling the effects for a few days), I did end up scaling back a little on my sprints because of my back. I did my first sprint at 12 mph (whew that was intense) and then did most of the others at 10 mph. I was bummed that I wasn’t able to push myself on the sprints as much because of my back. We did a little stretching at the end of class, and bending forward to touch my toes felt so good. I walked a bit after class, and the walking also helped relieve some of the back pain. I tried to stand up at my stand up desk several times throughout the day to make sure that my muscles weren’t tightening up too much. In short, I don’t love rowing but I do think it can have a place in a good workout. 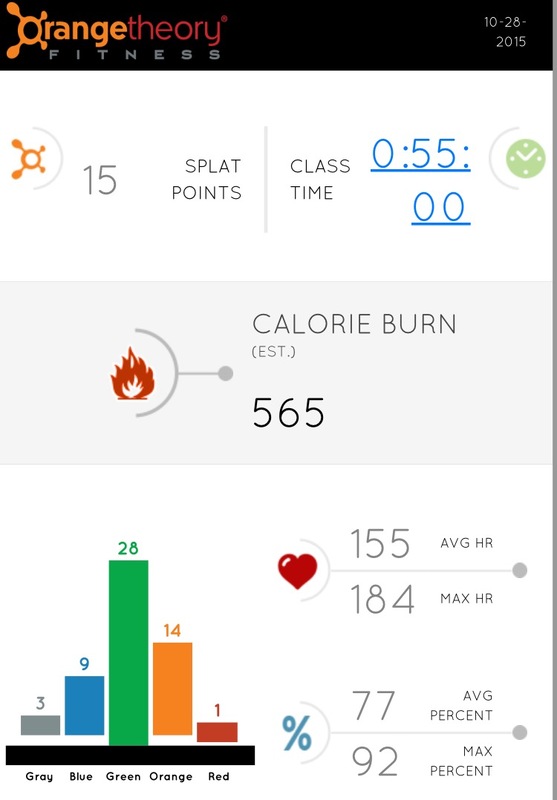 Just maybe not for 23 minutes when you are trying to push your heart rate into the orange zone. I went to bed on Monday with my back still feeling pretty ouchy from the morning rowing. Luckily, I woke up on Tuesday and only had a tiny tinge of pain left. Hell Week would continue! Tuesday’s workout was divided into three 15-minute segments: one for floor/strength work and two involving quick switching the treadmill and… wait for it… more rowing (!!!!!!). We started with warmup, per usual. I basically elbowed my way to the entrance of class so that I could be assured a treadmill for warmup. I really did not want to row. Then we began the workout. I started on the floor, where we did a variety of high-rep moves–some with pretty heavyweights (mainly for upper body) and some using body weight (jump squats, bench jumps). Next, we alternated between the treadmill and the rower with a partner, with one person rowing while the other ran for 1/10 mile “all out” with increasing inclines, and then switching. For the first 15 minutes, I was trying to be cognizant of my back, so I wasn’t doing full-range rows; I was just sitting upright and using my arms more instead of my back. It was really tough to get into the orange zone with this modification (it’s hard to get into the orange zone rowing even without the modification, IMHO), and I had only been in the orange zone for 4 minutes after spending 15 minutes on the treadmill/rower. All of those minutes were earned during my short treadmill sprints, but each sprint was only about 30 seconds, so it took close to 8 rounds of running to reach 4 minutes in orange. For the second 15 minute segment, I asked the trainer for a non-rowing option to protect my back and moved over to the strider, which is a basic elliptical. This was a great modification, and I was able to really up the intensity on the strider as well as on the runs (which I was doing at 11 or 10 mph depending on the incline) to get into the orange zone for a good chunk of the last 15 minutes. 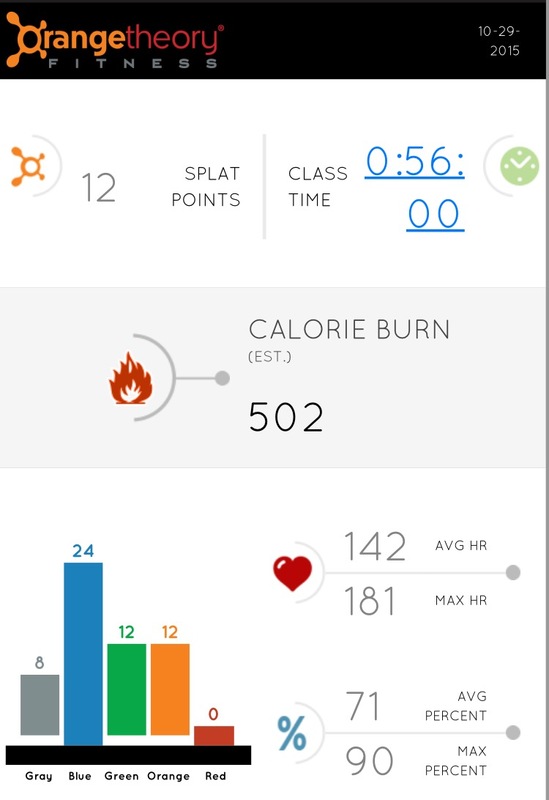 This was my favorite Orangetheory Hell Week workout so far. Probably because it focused mostly on legs. But it also gave me a chance to do some nice fast intervals for my 5K training. Running to class, my body was feeling a little fatigued from the previous days’ workouts (as a reminder, I run just under 4 miles to get to OTF). But I was hoping once I got to class, I would be pumped by the music and the group. Class began with normal warmup. Per usual, I used the treadmill. The treadmill workout was two blocks. The first block involved “push” intervals using an incline, alternated with squat pulses to get the legs burning. I noticed that I was spending a fair amount of the first two intervals in the green zone, rather than orange, so I tried to push my “push” (heh) outside of my normal comfort zone. I ended up going around 9 mph for my “push.” The second block was a short block of quick “all out” runs on the incline. Great for my training. The first of two floor blocks involved rowing, so I opted to use the spin bike instead. My back was feeling a lot better compared to the first day of rowing but still a little tender, and I didn’t want to make it worse. Our lifting intervals included movements such as a million lunges (exaggerating slightly), a few deadlifts, isometric squat holds, and ground-to-over-heads. We ended class with 2 minutes of holding a squat position and jump squats (love!). And then of course a stretch. I am happy to report that Thursday’s workout had no rowing! We warmed up (treadmill! ), then began the treadmill portion of class, which was four blocks of progressively longer or shorter rolling hill intervals. Example: 30 seconds of power-walking at steep incline (15%), then 30 seconds “all-out” on flat road (1%), then 45 seconds of power-walking, then 45 seconds of “all-out”… We counted up the first block, then down the second block, then up the third block, then down the second block. 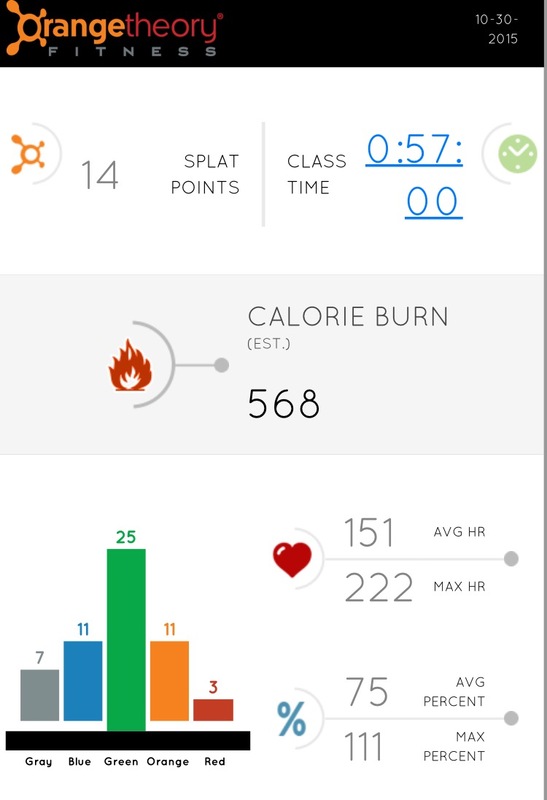 I liked this workout a lot and got some quality time in the orange zone. Next, we moved to the floor for 20 or so minutes of straight up lifting–no cardio. This was basically a long circuit workout of push ups, TRX rows, chest presses, tricep extensions, bicep curls, bicycle crunches, etc. which continued on the pyramid theme. The focus was on the upper body, which was nice after all of the squats on Wednesday. We did many, many reps of each movement, and each set was a struggle by the end. For example: two sets of 40 pushups! (Mine were basically little pulses and, yes, I used my knees.) I tried to use relatively heavy weights (15 lbs for most, 10 lbs for a few movements) to get the most out of this workout. At the end of class, we did a group plank for 90 seconds and then stretched. Yay Friday! I made it! I had to be at work early on Friday, so I went to class after work in the evening. I SO just wanted to curl up and go to sleep, especially on a Friday! But I had to get that shirt! I ran to the studio with tired legs and slightly sore arms. We did the usual warm up (treadmill!). The first half of class two blocks using the treadmill and the rower, which I felt recovered enough to use. We did longer intervals on the treadmill (first block: 2 X .25 miles and second block: 2 X .50 miles) incorporating rowing (400 m and 800 m) and some isometric squat holds (is there a better name for those?). I liked this workout because I was able to test out my speed for a slightly longer interval than normal. I ran at 10 mph for all intervals except the final half mile interval, which I ran at 9.5 mph. Running that fast felt great, and I am hopeful that being able to do half mile intervals at 6 min/mile pace means I’ll be a-OK for a 5K at 7 min/mile… We shall see. The “floor” portion of class involved a series of body weight exercises: mountain-climbers, burpees (I swear I look so awkward/klunky doing burpees), push ups (luckily just a few), jump squats (my fave), jumping lunges, etc. I was surprised to earn a few splat points during the floor portion. Those jumping moves get the heart going! We ended with a quick stretch. Whew, I survived! That was pretty fun, and I think all-in-all great training for my upcoming 5K, and even for my marathon. It was also nice to be committed to something as the weather has been changing and the mornings have been getting darker. So much temptation to sleep in! Did anyone else do Hell Week? Anyone feeling inspired to try Orangetheory? Any similar workouts I should be checking out? This entry was posted in "Test Runs" and tagged Cross-Training, Fitness, Fitness Class, Hell Week, Marathon Training, Orangetheory, Rowing, Running, Treadmill Running, TRX by athlettuce. Bookmark the permalink.